← ANOTHER FREEBIE IS HERE! TELL YOUR FRIENDS! Hey, guys! 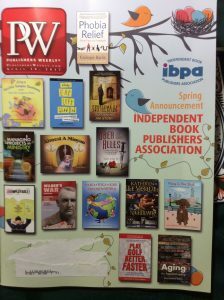 Sorry to toot my own horn, but I’m on the cover of Publishers Weekly! Well, not me, exactly, but my book, Problems of Translation. I feel quite thrilled to see that image of my book staring up at me from the cover of this April 18, 2017 issue, devoted to independently published books. It’s one of only two works of literary fiction that are depicted, and very prominently placed, I might add! In case you’re unaware, Publisher’s Weekly is the bible of the publishing industry, read by publishers, editors, agents, librarians and everyone else in the biz. One can only hope that this adds to the sale of the book (or helps attract a wider readership, which is what I’m primarily interested in). After all, I wrote it to be read! This entry was posted in More About Jim, On Books, Problems of Translation -- A Novel, Publications, Whatever. Bookmark the permalink.